The SirenGPS phone application helps caregivers during emergencies. SirenGPS is an emergency panic button app available for a caregiver’s smartphone. According to SirenGPS, more than 75% of 911 calls are made from cell phones. Every second is vital during an emergency. A First responder’s responsibility is to help the patient. An emergency panic button will allow them to help them quickly. This mobile emergency panic button is free to use for every caregiver. Caregivers must create a profile when first opening the application. Caregivers can add required medications and medical conditions to make the emergency response more effective. In case of emergency, caregivers can stay up to date with local notices through the application after completing their profile. During an emergency, the caregiver’s location will be given to the dispatcher, allowing for emergency services to reach the caregiver and patient more quickly. Easy access to emergency services gives caregivers time to use their Caregiver Training to provide first aid during an emergency. Senior caregivers, please give us your feedback on SirenGPS! Share your caregiver certificate on Facebook or view our Stress Relief Photo of the week! The Grateful phone application helps caregivers improve their mood by keeping a journal. Grateful is a free gratitude journal app available for a caregiver’s smartphone and tablet. Gratitude journals have many benefits, such as improving relationships and health. This daily gratitude journal acts as an easy template for caregivers to begin tracking their best memories. This gratitude journal is free to use for every caregiver. Caregivers do not need a login and can start journaling right away. The first 15 entries are free to use immediately. For $3.99 caregivers unlock unlimited journal entries, journal backups to Dropbox, and more. After downloading the Grateful app caregivers can write their first entry right away. Grateful provides daily gratitude prompts to fill out; it is designed to make writing journal entries easy. Here is a sample gratitude prompts caregivers can answer: what made you smile today? Caregivers can also add pictures to remind them of their journal entry that day. Keeping a gratitude journal helps caregivers face adversity and use their Caregiver Training to help others in improving their quality of life. Senior caregivers please give us your feedback on Grateful! The Flipp phone application help caregivers get ready for Black Friday and Cyber Monday 2017. Flipp is a free online couponing app available for a caregiver’s smartphone and tablet. A Black Friday game plan helps caregivers get the best savings both online and in the store. This couponing app is free to use for every caregiver. Caregivers can even log into their Facebook or Google accounts to sync shopping lists to their accounts. Online shopping lists keeps caregivers organized when shopping. After downloading the Flipp caregivers input their location and find discounts at their local stores. 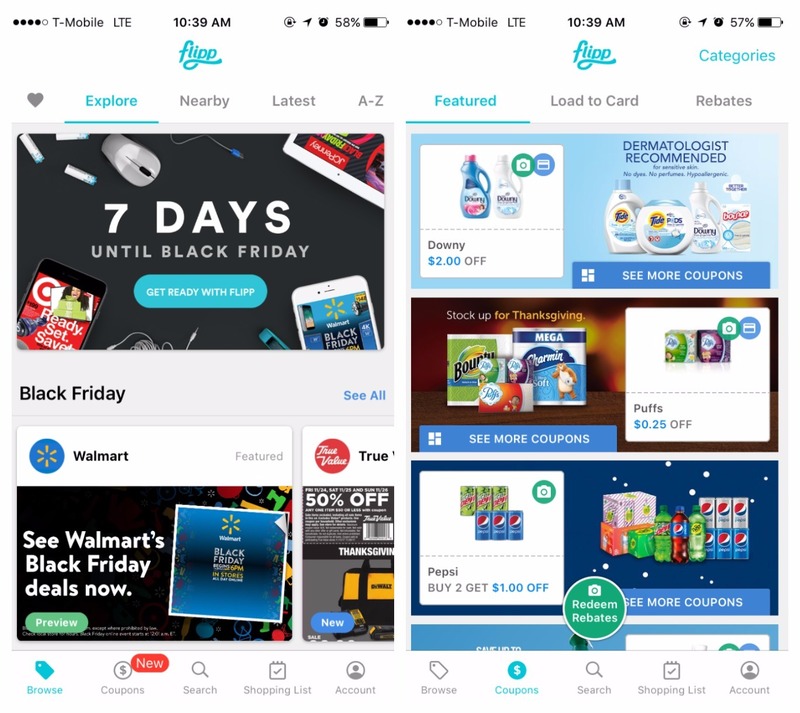 Flipp has coupons for Walmart, Target, local grocery stores, and many more. Weekly ad circulars are now online and available for browsing on the Flipp app. Caregiver’s can also find Black Friday Deals with this app. Flipp can save caregivers 20%- 70% every week. Savings on groceries and other household help the caregiver in their daily life. The huge savings available in the Flipp app frees up caregivers and allows them to further their Caregiver Training and education. Senior caregivers please give us your feedback on Flipp! First Aid by American Red Cross helps caregivers prepare for emergencies both for themselves, and for their patients. The First Aid application is a free pocket first aid guide available for a caregiver's phone or tablet. Basic first aid procedures are vital to a caregiver’s training. This app acts as a portable first aid kit for caregivers. 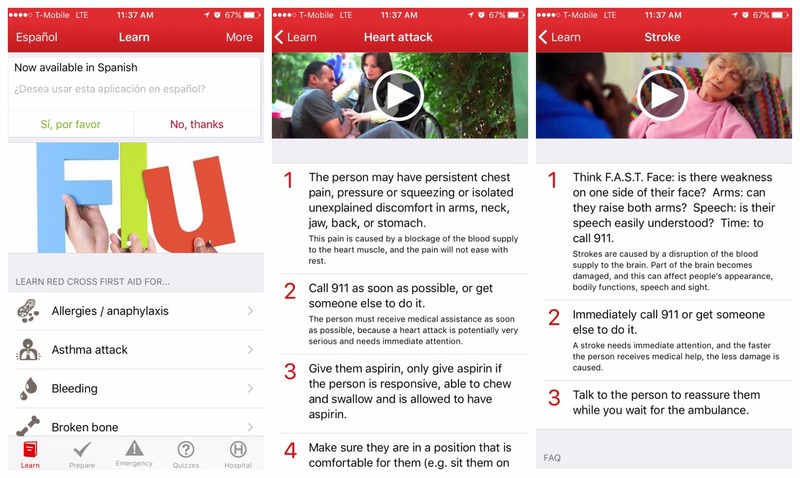 This first aid guide book app is free to use for every caregiver. The American Red Cross offers free information about caregiving emergencies such as, heart attacks. It also provides guides on basic first aid procedures, such as CPR. After downloading the First Aid app caregivers can choose to learn about a variety of first aid procedures. All emergency scenarios are covered. There are first aid quizzes available in the app, and interactive videos to aid in preparing for emergencies. First Aid also offers emergency guides in Spanish. The benefits of first aid training are huge, the First Aid app is a great addition to our Caregiver Training. Completing the basic caregiver training and having the First Aid app will help the caregiver be prepared for every emergency while working with their patients. Senior caregivers please give us your feedback on First Aid by American Red Cross! Get involved by sharing your caregiver certificate on Facebook or re-tweet our Stress Relief Photo of the week on our Twitter! 1. Give them a day to themselves. If you are able to give the patient the care they require, let the caregivers take a day off. Send them off to the spa or to see their favorite sports team. An unexpected day off is always appreciated. If a spontaneous act such as this isn’t possible, gift them tickets or gift cards that they can take advantage of when they have the time. 2. Write them a letter. Caregivers and all the work they do are unfortunately often taken for granted. Write a heartfelt note to let them know that their hard work is being noticed by others. It takes a strong person to dedicate their time to assisting others, and it’s absolutely a task that should be recognized. 3. Offer to help. Sometimes all it takes to thank someone is to give a little assistance. Taking care of another person can be exhausting, so try to lighten their load and give them more company by helping the caregiver out for a day. There’s always something to do around the house that you could do for them. 4. Create a thank you basket. Drop off a basket for them full of goodies and activities that they enjoy. This could include their favorite snacks or crosswords that they enjoy doing in their spare time. A basket full of their favorite treats is a sure way to brighten their day and give them something to look forward to when they have a break. 5. Pay it forward. Caregivers are often people that have a positive influence on others’ lives. They are such caring and generous people that it’s likely you’ll want to incorporate their qualities into your life. Let them know how much you appreciate them by reflecting their generosity in your daily activities. You could pay for another person’s meal and write them a note explaining your inspiration. Hopefully this will inspire them as well. Also consider donating in their name to a cause that is important to the caregiver in your life. This way to thank a caregiver is special because your thankfulness is often spread to others in your community. Remember, more caregivers are needed for senior care as more seniors are deciding to stay in their own home for care. Find out how to become a certified caregiver in your state and apply for a Part-time or Full-time Caregiving job (no experience required). The Dashlane App helps busy caregivers keep track of passwords, usernames, and more. Dashlane is a free password manager application available for a caregiver's phone or tablet. Caregivers have too many passwords to remember, Dashlane gives them a secure way to store passwords. There is an option to upgrade to Premium for $3.33 per month. Premium allows caregivers to backup their account, sync passwords across multiple devices, and add more security features to protect their information. By downloading Dashlane today you can get a 30 day trial of their premium features. After creating an account Caregivers can choose to store passwords from Facebook, online banking, and even Caregiverlist.com. Caregivers can check the strength of their passwords to make sure their online account are safe. Along with the password strength checker, Dashlane has a password generator to create secure logins. Dashlane also offers secure credit or debit card storage, so Caregiver's can remember their card number online. Caregiver's can use Dashlane to store their username and password to their Caregiver Training University account for quick and safe access to their certificate. Senior caregivers please give us your feedback on Dashlane!